Hubity is the Social Media Hub where you can learn from its Step by Step Video tutorial How to use Google+ for business, Google Hangouts to meet 10 persons online video conferencing, Youtube channel Video Marketing, Leads Capturing and Landing pages for you to work online with your Social Networking Business or any other online Business to get more leads & prospects, more sales to earn your MLM passive income from NOW ! This FREE access will be down soon. For the next batch Aunew Distributors will be charged $10.00 Subscription Fee to enjoy all the facilities in the Net Builder Workshop and Newsletter twice a month. 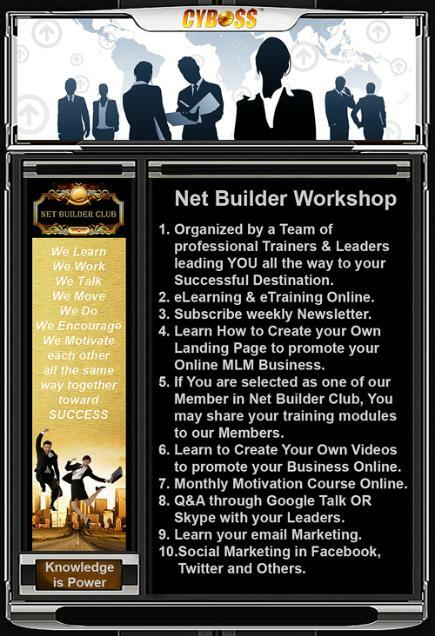 EFH successful team (Net Builder Club) does not make you success for anything, but it inspires your success potential. If you have time, then join to our successful team in the EFH Net Builder Workshop where it comes from different sectors of a variety of professional eMLM Marketers, Leaders and Trainers to share their Successful Techniques and experiences. Perhaps you can find people who have similar to your background story. Here we will tell you their successful experiences to Earn From Home Online eMLM Business to find your own way to Success in this industry. CHEERS ! In this Step by Step Videos and Audios tutorial will help you to create your own website from the very beginning with a few click without knowing any HTML coding, FTP hosting, Web building and anything about creating a website. If you know how to write on Microsoft Word, Picassa image editing, Drag & Drop, Copy & Paste with a computer online, you can easily building your own website within hours. First, you listen and attend our Step by Step tutorial Videos few times and start developing with our site builder. You can build your own website on web Earning Money Online of your own management and control within hours. How much do you think it will cost you to attend this type of training class locally. those trainer may charge you thousands of dollar for just telling you the theory only. And you need to learn lots of complicated HTML coding, FTP hosting, images developing and spend lots of time to maintain your website. 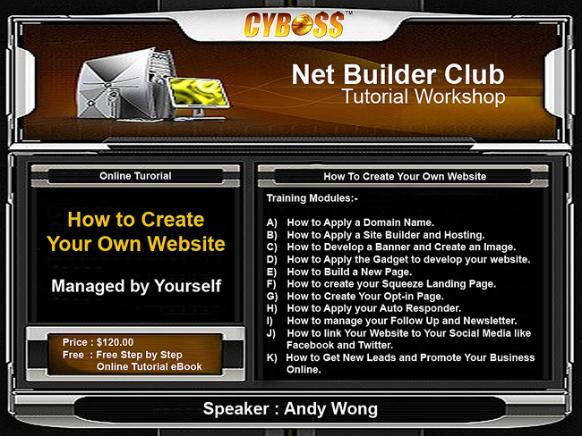 Today, Net Builder Club offer you the most easiest way to Create your Own Website without knowing any knowledge about developing a website. If you are capable to listen and read, here we off a very SPECIAL PRIZE for Myaunew Distributors. You just pay one time for the Step by Step tutorial videos and Audios to start off building your own website for $68.00 ONLY. 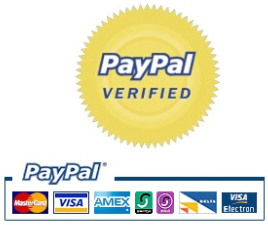 Make your payment with the above PayPal Verified Payment Gateway to get your Transaction ID # . Copy it and paste on the following Form to verify your payment and within minutes, you will receive an email to register in Net Builder Club and reconfirm your email address to get your Access to our Tutorial Site. We will be at the other side waiting for you anywhere and anytime to serve you. Cheers ! Prepared by Net Builder Club.